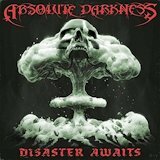 A little over a year after SF death/thrashers Absolute Darkness sent us their debut, they return with Disaster Awaits, a second round of Bay Area-infused melodeath. If you liked the last one, you'll like this; like its predecessor, Disaster Awaits combines melodic plodding with some faster thrashing with a heavy overall sound. Amon Amarth is definitely the biggest influence. The midrange lead guitar on top of a heavy chugging rhythm is a dead ringer for the Swedes' recent albums, though the lead guitars occasionally seems off-key from the rhythm riffs. Where we get the best from that approach is on tunes like Battle Won or Lost?, or Chaos Unleashed which have a snappier thrash sound to them than some of the others. These are the high points; though the band perks up every time it hits a high tempo, it droops when midtempo songs come up, though the title track avoids this by putting a crushing riff on the slower portions, letting it boil up into fury in between verses. US politics continue to be a big influence on the lyrics. Absolute Darkness had some political songs in the last album, and with the Trump presidency well under way, tracks along similar lines appear on this one as well. But for those suffering from political-outrage fatigue and looking for musical relief, this may not exactly be the most pleasing aspect of the tracks. Despite its creators' interests, Disaster Awaits seems to do best when it leaves both the Commander-in-Chief and Amon Amarth behind for a while and lets the riffs do the talking.